This is a post 4 years in the making. Back in 2009, when I was still a student living in Manchester, a couple of good American friends of mine took a break from backpacking around Europe and dropped by for a weekend of hangovers. When they first arrived, I remember having nothing to feed them apart from half of a banoffee pie that I'd made a couple of nights earlier. And so, we cracked open a few cold beers, each grabbed a fork, and got stuck in over countless tales of cheap lager, beer pong and water balloon launchers. Great times. Anyhow, the pie was a hit, and since then I've been peppered with requests from them both to make another a ship it over to them. Now I can't (be bothered to) do that, so this is the next best thing. This is a recipe that I've always loved, but haven't been able to make for awhile because my fiancee has had an aversion to (bordering on fear of) bananas for as long as I can remember. Seriously. As in you could chase her out of the room with one if you felt inclined to do so. But she got some help, and she's seeing a really good bag of granola - we think she's on the mend. Take 250g of digestive biscuits and blitz them up with 100g of butter, until you've got a nice damp crumble mixture. I prefer chocolate digestives because...chocolate. Press the crumbs down into a pie mould or cake tin and then leave in the fridge to chill for about half an hour. If you're like me and are stuck for space in your fridge then this is the perfect opportunity for a clear out/buffet. Melt 100g of butter in a saucepan along with 100g of brown sugar and once the sugar has dissolved add a tin of condensed milk. I had this jar of confiture du lait that my parents brought back from France and I substituted this for the condensed milk. Feel free to do the same but expect me to aggressively question you as to why my parents are bringing you presents back from France. This stuff was a bit of a mystery to begin with as it was gifted to me with this accompanying sentence - 'We don't know what this is but we think you'd like it.' I did like it. It's basically a caramel sauce made with milk and sugar. You simply cannot go wrong. Bring the sugar, butter and condensed milk mixture to the boil, stir for about a minute and then spread evenly over your buttery biscuit base. Refrain from sticking your face in the hot caramel and shove the pie in the fridge for about an hour to cool. It's so shiny you can even see my face. Grim. 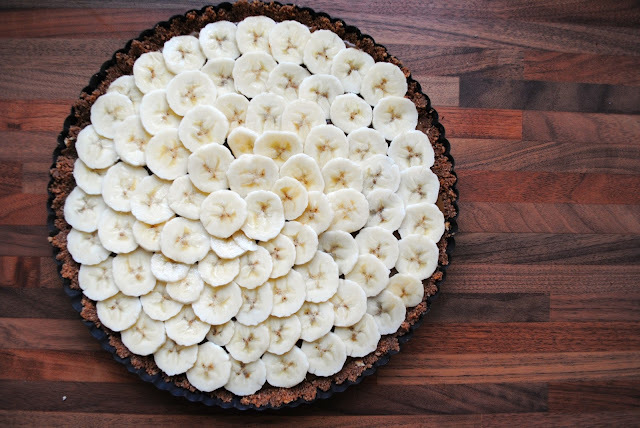 Once the pie has cooled, slice two big bananas and then spread the pieces across the caramel. 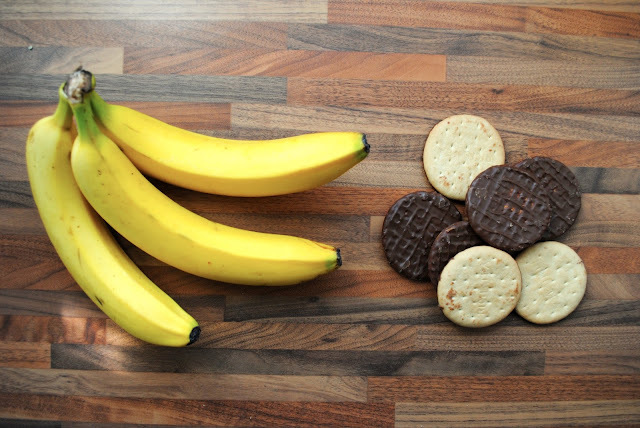 Go as heavy or as light on the bananas as you like here - as we're still weening the missus onto the things I only did one layer, but you can stack them as high as you like. YOU'RE SO CLOSE! Mix a carton of whipping cream with a couple of teaspoons of vanilla extract and using a hand mixer, whip until it's a thick cream. Dollop and spread over your pie, then grate chocolate on top. Buy a nice bar of milk chocolate, or use leftover Xmas choccies. It's your call. And that's your banoffee pie folks. Slice it up, serve it up, eat it up. mmmmmmm its my favourite pie!!! !